Women-led self-help groups provide economic, social and vocational development for the entire community. They say a woman’s work is never done, yet for many women in Africa it barely has a chance to begin. That’s because women are often excluded from owning land and getting access to loans and credit – activities upon which poverty-busting income generation endeavours depend. Women-led self-help groups are changing this reality for communities across Africa (and throughout the developing world) by creating a sustainable, empowering and capacity-building model of economic development. Grassroots-based self-help groups, village savings and loans associations, farming collectives and vocational training programs are sprouting up in impoverished communities, often rural or remote, where women and children are the most vulnerable to poverty. Many of these communities include a high proportion of child- and grandparent-led families as a result of the toll HIV/AIDS has taken on primary income earners. Others, reliant on small-scale farming as their main livelihood, have been afflicted by climate change, soil erosion and deforestation, the combined and cumulative effects of which have reduced crop yields to below subsistence levels. Throughout Africa, rising fuel costs and the ongoing impact of global economic recession have made it almost impossible for farmers to get their produce to market, leaving farmers and herders unable to feed their families much less invest in sustainable agricultural methods to carry them through lean years. And for non-farmers living in poverty, the lack of income means they cannot afford food even when it is available, nor the health care or education to be able to navigate a way out of the vicious cycle of poverty for themselves and their children. 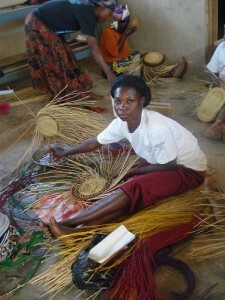 Basket weaving is lucrative for many women's groups. None of this is new news. What is new is the growing recognition that women and other female guardians – the ones most often left holding the family together in the wake left by these socioeconomic forces – are also the ones who hold the keys to livelihood diversification and long-term poverty reduction. Women like Meseret Girma. She’s a 32-year-old widow, the sole breadwinner of a family of four including herself, her two children and a younger brother who live just outside Addis Ababa, Ethiopia. In 2004, Meseret was a housewife and the family was living relatively comfortably on her husband’s monthly salary as a soldier. But after he was killed in the Ethio-Eritrean border conflict, life changed dramatically for Meseret and the remaining members of her family. Her husband’s death pension amounts to just $11(CAD) per day. Meseret took occasional work as a daily labourer and a housemaid, earning barely enough to cover the family’s rent and grocery bills. “Luxuries” – like school supplies and uniforms so that her son and daughter could attend school – were out of the question. 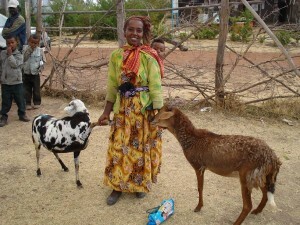 Income generation from livestock allows this Ethiopian woman - an EDA beneficiary - to make a better life for her family. Now meet Emmanuel Development Association (EDA) – a CFTC local partner organization in Addis Ababa that provides access to alternative basic education (ABE), community health, vocational training and income generation opportunities to marginalized community members. EDA trained Meseret as a tailor, and set her up with a small loan to rent a sewing machine. Meseret established a clothing repair and tailoring business and joined the Abay Minch women’s group, recently becoming one of its executive committee members responsible for the financial activities of the group’s business. Meseret’s son just completed Grade 5 at Gelane Primary School, an EDA-supported ABE centre. Her daughter is entering Grade 8, and Meseret’s brother is attending vocational training. And importantly, the Abay Minch women’s self-help group now offers savings plans and loans to dozens of women who are at the core of a thriving local economy of business women, farmers and entrepreneurs. Northern Ghanaian farmer, Ms. Akazariwen, discusses the work of her self-help group with CFTC Country Rep, Chrys Anab. Kubura Sulemana, a farmer in Zoosali, Northern Ghana, has a similar story. Like Meseret, Kubura has benefitted from training and seed capital provided by RAINS, the Regional Advisory Information and Network Systems, which operates in Tamale, Northern Ghana. RAINS, like EDA in Ethiopia, builds community and institutional capacity by offering vocational, business and agricultural training. RAINS promotes the sustainable use and management of farmland and other agricultural resources by helping to establish farming collectives, and delivering sophisticated agricultural consultation and training to women, youth and other vulnerable groups. 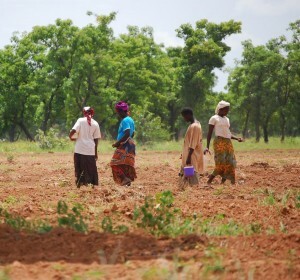 RAINS has established women’s farm collectives for hundreds of women in the Northern Region – the poorest in Ghana, and one highly susceptible to drought. And not just any farms, but organic farms where maize, groundnuts and beans are grown in environmentally-sensitive ways that make optimal and sustainable use of the land and resources required to farm it. 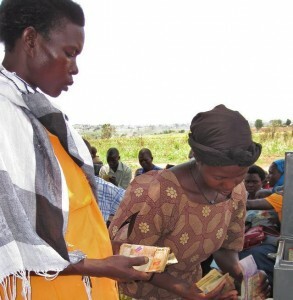 In 2010, RAINS was able to help 120 women – including Kubura – secure land and credit. “Women in this part of the country usually do not have access to land. But thanks to RAINS, we now own land that we farm on. We now contribute to the welfare of our families, and especially our children’s education,” said Kubura. Kpachelo, Ghana: These organic farmers are sowing groundnut. Groups like theirs have seen 50 per cent increases in crop yields. Results so far have been excellent. The 120 organic farmers have seen a 50 per cent increase in crop yields resulting in an average 25 per cent increase in income. An additional 80 women have been trained in organic farming techniques and are in the queue to receive a plot of land to start planting as soon as one becomes available. These women can now improve and sustain a higher quality of life for their families on income from the sale of their produce. But beyond this, they have gained political and economic clout that has made it easier for them to access credit from rural banks. Some of them have established savings groups to meet their production and the educational needs of their children. Their solidarity benefits these women not just economically, but socially and psychologically, too. And it benefits their entire communities, strengthening them from within and lifting them to new levels of self-sufficiency. It really does take a village to raise a child – and when that village is filled with empowered women, those children are raised to be healthy, educated members of society. That’s when a woman’s work has the greatest impact of all.